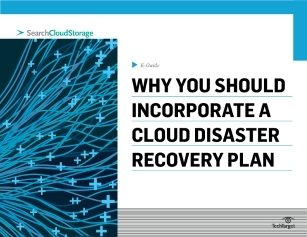 Cloud backup and disaster recovery (DR) is gaining in popularity as many believe it can provide a higher level of protection at a lower cost, but some organizations still hesitate to incorporate a cloud DR plan. Access this expert e-guide to learn why you should consider incorporating cloud storage into your DR planning, testing and deployment. You’ll also get some questions to consider prior to deploying a DR cloud solution as well as the benefits cloud backup can provide and more.